If you want to give your turtle the cleanest home possible, you want to make sure you get your hands on one of the best turtle filters out there. Some of the best aquarium filter for turtles are quiet and can stand up to being used in shallow water environments. This is perfect for turtles who like to bask in the sun(lamp). We’ve also included some great filters that can be used for aquatic turtles. Tank Capacity: The tank capacity is incredibly important as this will determine whether or not this filter is right for your turtle. Be sure to keep in mind how much water your turtle needs in the tank before choosing a filter. Quiet: Nobody wants to fall asleep to the loud humming of a water filter. Be sure to pick a filter that is quiet and efficient if your turtle lives near where you sleep. Water Level: The water level your filter needs is another important factor when choosing a turtle filter. Many filters on this list merely need their intake valves submerged, so pay attention to the specific specs of your filter. Type: The type is another thing that depends heavily on what kind of turtle you have. Canister filters are typically better for larger tanks, and external ones can be incredibly useful for shallow water tanks. Warranty: You want your filter to last your turtle’s whole life, so be sure to check the warranty to see if your filter can stand up to the task. Some filters come with long warranties while others have none at all. Size: The size of the filter is important because you don’t want your filter to not fit properly in your tank or worse, take up more room than your turtle. Now that you know what to look for in turtle filter reviews, we can get right to the good stuff. Our turtle filter buying guide will help you choose a filter that is perfect for both you and your turtle. If you are new to buying turtle filters, start with our top and budget picks, they’re what we consider the best of the best. We’ve also included eight other amazing filters for you to choose from. If you’re stuck wondering “what is the best filter for a turtle tank?” We’ve got your back. Our top pick is an awesome filter that blends right in. This decorative filter by Tetra will fit right into your turtle’s habitat. It will also give them something to interact with in the water. It can help to instantly create a waterfall and a basking area for your turtle while filtering it tank water. 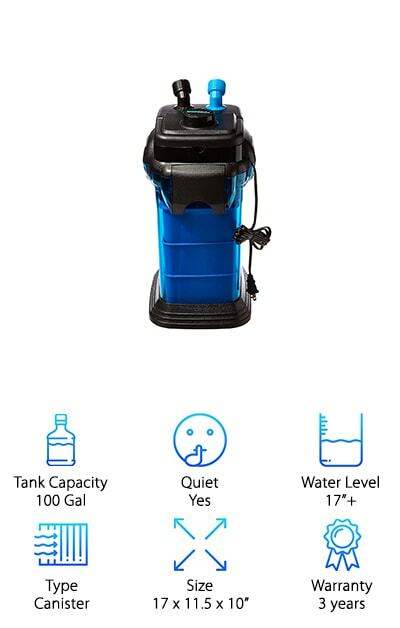 The innovative three-stage whisper filtration is incredibly quiet. The Bio Bags, which are easily replaceable, make cleaning out your filter a breeze. It has large intake holes to prevent it from getting clogged and creating a problem for you. The locking cover on the outside of the filter prevents your turtle from getting into the filtration area. On top of that, it provides an ideal basking area for your scaly friend. 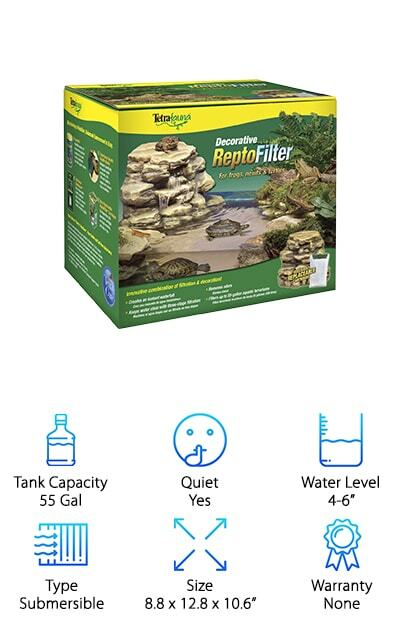 This filter is the perfect choice for anyone who needs a 55 gallon turtle tank filter. This awesome filter is the best water filter for turtle tank users on a budget. This tank filter provides mechanical, chemical, and biological filtration. Using the Aqueon specialty filter pads you can even receive additional filtration power. This filter is self-priming and it starts up automatically after cleaning or power interruption. This takes the worry out of tank maintenance as you'll never have to be concerned after a power outage or cleaning. The LED indicator light flashes when it's time to replace clogged cartridges so you'll never have to worry about missing a cleaning. it makes these indications based on actual water levels. The internal pump helps to dampen the noise and eliminate leaks. This filter even comes with a lifetime warranty so you can be confident buying a filter that you know will last you. This filter comes in multiple sizes and configuration so you can choose whichever one is best for you. This particular configuration works best for 20-gallon tanks. This filter by Penn Plax is hands-down one of the best canister filter for turtles out there. This filter comes in many different sizes and configurations so you can choose whichever one is best for you. Some configurations even include extra accessories that allow you to fully automate your filter. This particular filter comes with a quick and easy push-button self-primer. This means that it's always ready to go when you need it. It has Independent 360-degree rotating valve cap that allows it to filter effectively. It has a sturdy tip-proof base that means your turtles will not be able to knock it over. The flow rate cut off valves adjust the water flow depending on the level of your tank. This powerful filter can be used on aquariums for up to 100 gallons. it has three large media baskets that can be customized to meet the needs of all aquarists. It can even be used as a reptile aquarium filter. This incredible submersible filter is a great choice for anyone looking for the best turtle filter aquatic turtles. This filter has dual intakes that help it to prevent clogging. The easy to change cartridges make cleaning a breeze. 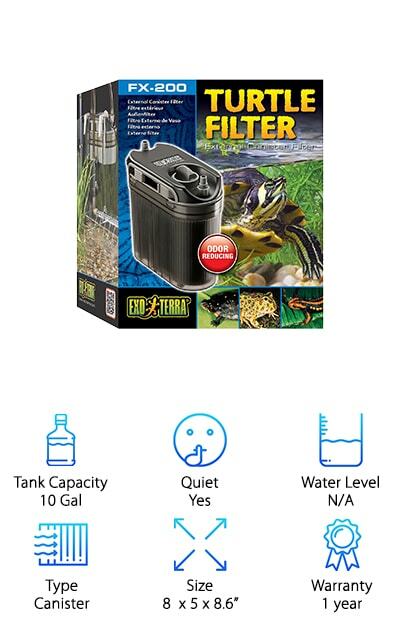 This filter is great for Aquatic turtle tank up to 30 gallons. It can also be used to filter box turtle ponds. It even comes with activated carbon and biological filter sponges to help you ensure that your turtle's environment is incredibly clean. This filter has a mechanical and chemical filtration system. This makes it incredibly efficient. The easy to change filter cartridges make the whole process incredibly easy. It can also be used in fish tanks. It can officially clean up to 15 gallons of water at a time. It comes with suction cups to allow you to easily attach it to the side of your aquarium. 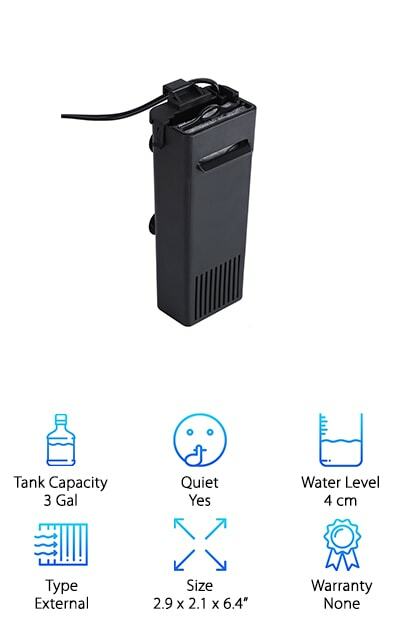 All you have to do is that this filter up is insert the activated carbon included, rinse it, and insert it into your aquarium. 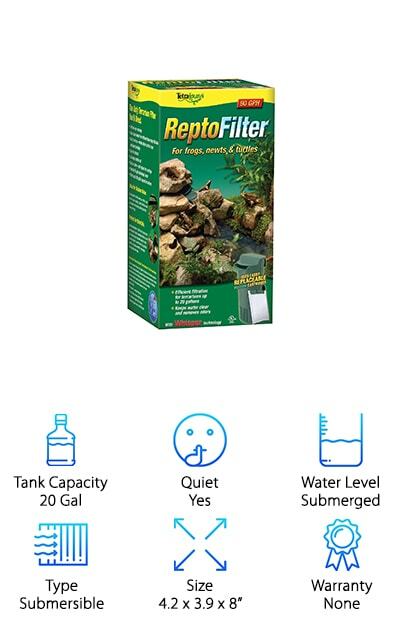 This filter by ExoTerra is a good turtle filter for anyone who wants something that goes on the outside of their aquarium. This external filter is ideal for turtle tanks or aquatic terrariums. 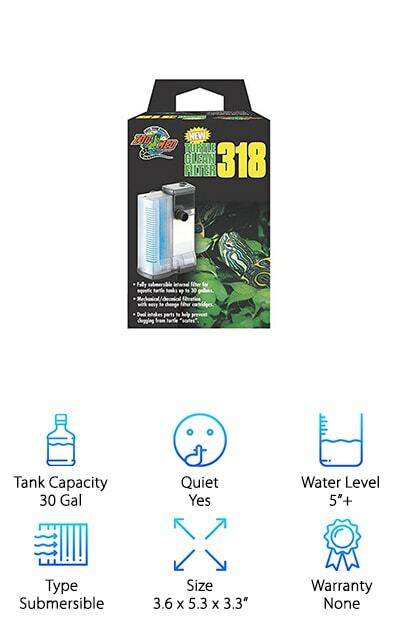 This turtle tank uses an odor filtering system that helps reduce odor from your turtle tank. 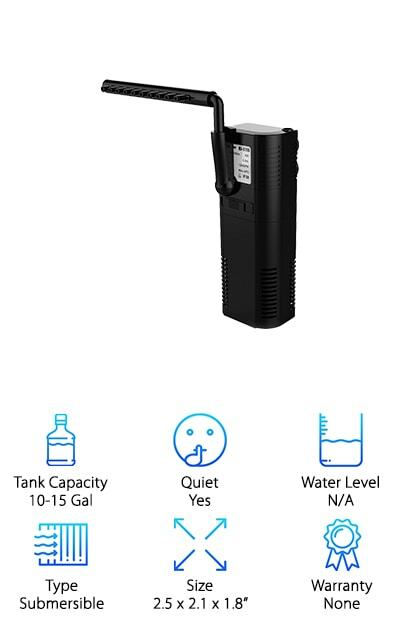 It balances performance and Incredibly high efficiency making it a competitor for the best canister filter for turtle tank. It comes with a dual filter system that allows you to have great flexibility in your filtration media. This allows you to strike a balance between mechanical and absorptive filtration. The flow rates for this filter have been precisely calculated to provide the exact balance needed between mechanical filtration and oxygen enrichment. This filter system comes with a lot of accessories. the included accessories are- one fine foam, two course foams, one odor reducing pad, and dual carbon pads. This is a great choice for anyone looking for a great filter for beginners. 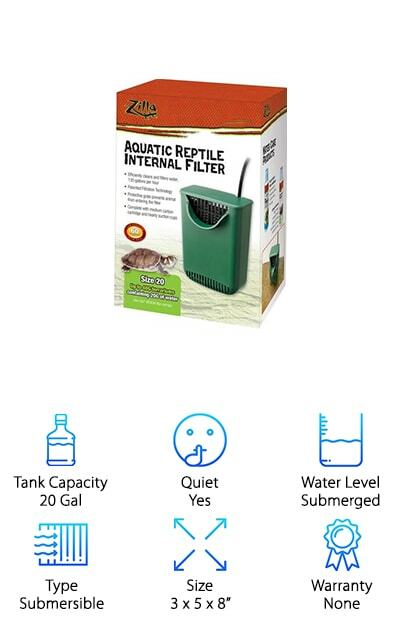 This filter in the top competitor for best aquatic turtle filter. It can be used in both indoor and outdoor fish tanks and turtle tanks. It can be used in two different configurations. One provides ornamental rain showers, and the other is used to increase the oxygen content of water accessories. This filter contains a nitrocellulose sponge which can filter large impurity as well as small ones. This promotes the growth of nitrifying bacteria, leaving your turtles happy and healthy. The activated carbon helps reduce odor from your turtle's tank. This is a great ornamental addition for your fish tank or turtle tank that also serves a great purpose. The motor is made of copper and does not use aluminum or aluminum alloy. This can help to increase heat dissipation and work efficiency. The motor adopts a high-strength wear-resistant shaft mandrel which helps to increase the service life. This tank is incredibly easy to clean. 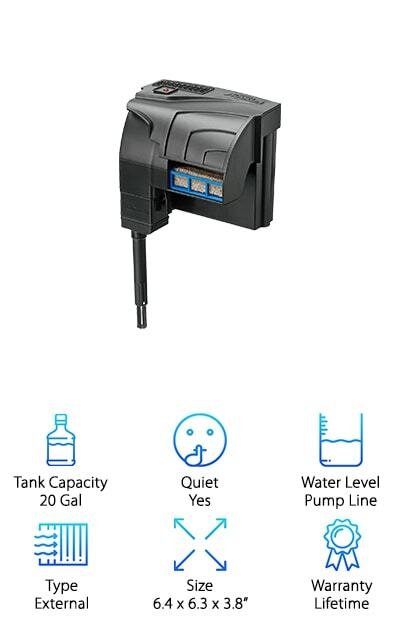 This is a great pick for anyone looking for the best filter for turtle tank. This tank is designed specifically to be used with 40-gallon tanks with 20 gallons of water. The wide cartridge provides a larger surface area for trapping debris. this makes it incredibly efficient cleaning your turtle's tank. The protective grate in the water return that prevents the reptile from climbing into the filter. This makes it not only a clean option for your turtle but an incredibly safe one as well. This filter includes a filter floss cartridge to provide superior filtration. It even includes suction cups to securely attach the filter to the side of your aquarium. This filter is a great choice for anyone who needs something that can work in larger tanks with less water capacity. This is perfect for animals like turtles or other aquatic reptiles. This is a great filter choice for anyone looking for a great filter. This awesome aquatic turtle filter is the perfect fit for anyone who wants something that can work for terrariums. This easy to install filter is the perfect choice for frogs, newts, and turtles. It provides quality 3-stage filtration that removes all kinds of debris show me your tank. It helps with discoloration and odor as well. It can also help with ammonia. This filter is ideal to be used on terrariums with up to 20 gallons of water. This filter is mechanical and uses a dense dual-sided mesh cartridge to catch debris and waste. It can also be a chemical filter using ultra-activated carbon to help remove odors and discoloration. It is also a biological filter using Bio-Foam to cultivate aerobic bacteria. Aerobic bacteria and help eliminate toxic ammonia and nitrates. This filter uses whisper filtration technology to ensure it is incredibly quiet. The design allows it to be used in shallow water environments. This is the perfect underwater filter for turtle tank, especially for users who have shallow water tanks. This filter is fairly submersible in both vertical and horizontal position. That makes it a great choice the people who have shallower tanks. It has an adjustable return flow rate so you can control how full your tank is at all times. The direction and height of the water return are also adjustable. This filter uses a 3-stage filtration system. It uses dense foam for particles and debris, activated carbon for toxins odors and discoloration, and a patented bio grid for ammonia and nitrates. This means that your tank is always incredibly clean and smells wonderful. 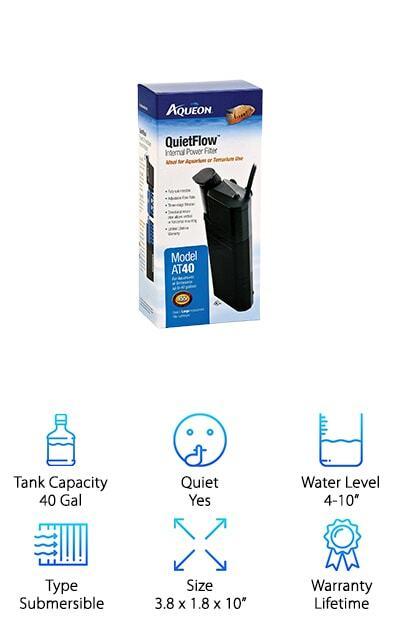 This filter uses Aqueon replacement internal filter cartridges so it's a great choice if you already have some Aqueon filters laying around. The adjustable height of the water return allows you to get the best effect on your turtle aquarium. This is the perfect 40 gallon turtle tank filter. It even comes a limited lifetime warranty. This is a good filter for turtle tank if you want to create a stunning waterfall effect. The filter simply hangs on the side of your fish tank with a hook. It creates a beautiful waterfall effect with the filtered water. This filter operates on the triple filtration function. It utilizes mechanical, chemical, and biological functions. This filter can help you increase the oxygen content in the water and enhances natural water circulation. This filter works by directly pumping water into the filter box using its motor. It then filters the water through the filtration element. Finally, the water is released through the waterfall back into the fish tank. This is a great filter for people who want to create a beautiful waterfall effect. It can be used in both freshwater and saltwater. This filter system is the perfect choice for anyone who needs a great filter with triple filtration.